After losing Applejack to compulsive lying, Pinkie Pie to angry paranoia, Rarity to abject greed, Fluttershy to bullydom, and Rainbow Dash to… well, losing Rainbow Dash altogether, Twilight Sparkle stages a last-ditch effort to vanquish Discord using the just-recovered Elements of Harmony. But with the living and breathing embodiments of the Elements so corrupted, the heroic move ends up fizzling out in rather undramatic fashion and Twilight joins the disharmonious group on account of a broken heart. Is friendship dead? Does Discord rule? Does Celestia drool? Oh Discord, you make us howl at the moon and sleep in the middle of a summer afternoon. Whatever did we do to make you take our world away? There’s a certain comfort in knowing that causality exists and the laws of physics apply everywhere equally, and when you yank that out from under us things just get so awkward! I’ve gotta hand it to Applejack and Pinkie Pie: their “becoming Discorded” scenes last episode involved an absurd amount of E̯͙͉N̢̝͖J̥̫̰̺O͈̙̤̙̭̫Y̷͎̦̹̲̙͖ͅ ̡̖̫Y̛O̦̹͉̯̪̫̬U̯͠R̼̘̞̲ ̦̙̻̕N̠͉͕̱͙͜I̯G̪̙͞H͍̟͚̼T̤͇̖͖̥̘͇M̘̹̭̬̜A̰̗̫̘R̯̺͕̬E̖͙̤͔͕S̫͔ but they seem to have shaken all that off pretty well. Or, perhaps, Pinkie’s too busy being angry at everypony to think about those creepy balloons (no, seriously, what the actual what) and AJ’s just convincing herself with (pretty lousy, if I say so myself) lies that her talking apple demon things were all a bunch of hooey. Rarity and Fluttershy didn’t get Discorded in ways so horrific, but they’re doing their best to kick poor AJ in the face make everypony else miserable in the most exaggerated fashion possible. Oh yeah, Discord’s lame riddle! I was originally going to go on about how contrived it seemed that Twilight was able to figure out the different parts of the riddle within mere seconds of beginning to think about it, but this is Discord we’re talking about. The Elements weren’t in the maze? Of course, he never said they were! They’re in Ponyville? Of course, th– well, okay, Twilight immediately assuming (correctly) they’d somehow be hidden inside (??!) the book she was reading at the very beginning of the series was a bit of a stretch, but at least it made for some pretty funny antics as Twilight kicks AJ in the face tries to deal with everypony’s ridiculousness and loses her flowers, several walls of her library, and her sanity in the process. We don’t get the full Twilight snap this episode (soon…), but when she finally gets the book back from her friends and shouts, “This is my book, and I’m gonna READ IT!” you know she’s on the brink. But then… TA DA! The Elements! They were in her library all along! Which leads me to wonder why Discord would bother “hiding” them there as opposed to somewhere a bit trickier to suss out, like, oh I don’t know, a thousand miles under the planet’s crust. 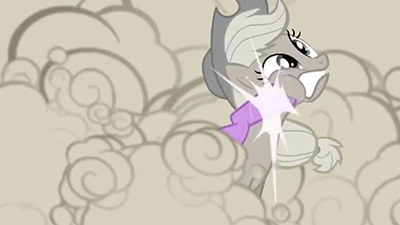 After all, they comprise what is ostensibly the only magic powerful enough to overcome Discord’s chaotic energies, so it would make sense to keep them as far away from the Mane Six as possible. But, of course, what fun is there in making sense? And so, with the Mane Six reunited (with Spike playing the role of Rainbow Dash) and the Magic of Friendship restored (minus the whole “restored” part), Twilight and her friends stand up to Discord in a grand showdown of… not a whole lot. I do wonder if Twilight truly believed her frazzled plan would work even in the slightest. That said, when she does begin doing her glowy eye thing, even Discord has to pull down his shades a bit to see whether it might actually work. But, of course, it doesn’t. What follows is poor Spike belching up each of Twilight’s old Friendship Reports to Princess Celestia, which I think was a pretty neat (if at first extremely wordy) mechanism to get Twilight to rekindle the magic of friendship within her and remind her friends of their mutual friendship as well. And by “remind” I don’t mean with words, but with direct magical manipulation of the brain. 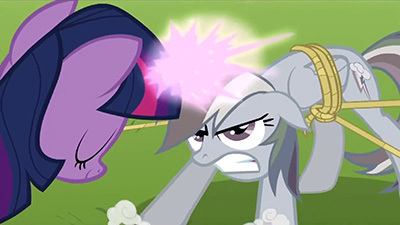 It would have been neat to see more of how Twilight and Spike managed to wrangle everypony down long enough to get zapped (Fluttershy looked to be quite the challenge), but devoting those minutes to rescuing Rainbow Dash was definitely the best use of what little time was left in the episode. It was about this point in the episode that I really saw each of the characters in their element once again (no pun intended), being those rich personalities that I know and love. And in a freaking high-speed aerial chase, no less! While Dashie’s cloud-car proved to be a formidable opponent, teamwork (and a lot of rope) eventually won the day and brought the Mane Six back together at last. I’ve said it several times before but it’s worth mentioning again: seeing the feral side of these ponies come out from time to time (like in the above scene) is awesome. We have a tendency to apply human characteristics to animals all the time to make them more relatable, and after a while it can be easy to forget that we’re dealing with different species with different unique traits when all we focus on are the human qualities. Bringing out the animal again at key moments makes for some excellent reminders of the kinds of creatures we’re dealing with. In an unrelated tangent, dem AJ/Rarity faces. 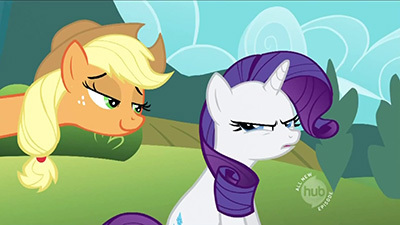 I know I blathered about my AJ/RD preference last season, but I do admit Applejack and Rarity make for quite the comedically clashing duo as well. Of course, Rainbow notices this and immediately puts a stop to it. 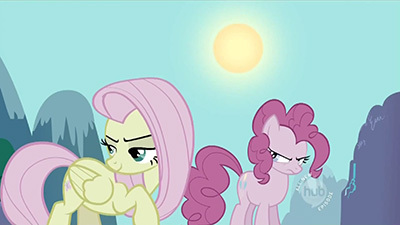 As for Pinkie and Fluttershy? Well, Pinkie’s just angry at how Flutters is just so much more adorable than she is (that one’s for you, Tessa; yeah I know it’s a reach of a reach 😛 ). 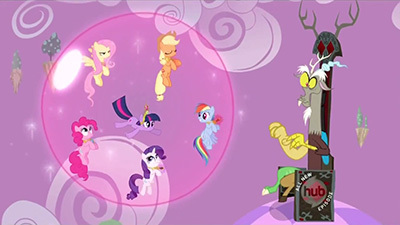 Anyway, with the Mane Six finally reunited and the Elements of Harmony back at full power, Discord doesn’t stand a chance. As with the way the sextet dispatched Nightmare Moon, though, the demise of Discord was similarly rushed and a bit contrived (don’t the villains ever think to, I dunno, move out of the way of the ROYAL RAINBOW). The baddie is zapped, everything poofs back to normal, celebrate the heroes, roll credits. Bing bang boom. 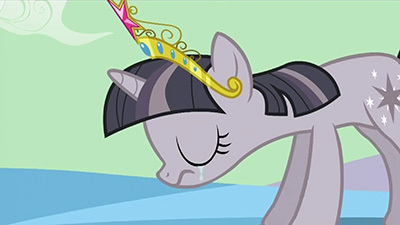 But what made me happiest was to see everypony return to their wonderful selves once again. When Pinkie ran off before the final showdown to get one last sip of chocolate rain, I knew they were back. That Discord got re-stoned and Ponyville got placed right-side up again was just icing on the cake. Fun episode! For some background music as you make your way down to Weston’s and Tessa’s parts, have some music dedicated to Tom in Look Out Here Comes Tom! (Blaze Remix) by Blaze (original mix by TuXe). Leave it to the brony fandom to make music about a big rock! Three major elements to this episode. 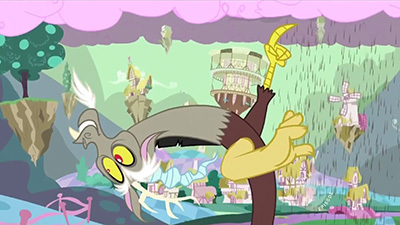 Discord’s slow grind against Twilight Sparkle’s resolve, getting the band back together, and defeating Discord. Discord takes much much longer to turn Twilight Sparkle against her friends than he needed to sap the attributes of the others. Even resilient Fluttershy went down with only a boot to the head. I think it’s because the Magic of Friendship is something he can’t subvert in the same way. Honesty, Loyalty, and Laughter are internal, but Friendship is inherently external. It synergizes, builds off the strength of everyone in the network, and according to Discord, is the greatest of the Elements. That, or Twilight Sparkle has a point-of-view character shield. Given Discord’s style, I wouldn’t put meta commentary past him. I’m a little surprised that the first failed attempt to use the Elements of Harmony got as far as it did. It seems that even while under Discord’s influence, the ponies still represent their attributes enough to use the Elements. That makes me think that it would have worked if Rainbow Dash had been there, and reinforces Discord’s motif of separation and isolation. Once Twilight Sparkle manages to shake off Discord’s influence, thanks to Princess Celestia’s intervention (poor Spike), she starts bringing the others back around with magic mind-meld headbutts. I’m okay with that. Applejack gets a quick flashback, the others get a brief flash of light, and poor Dash has a full on chase scene with wrangling and everything. The confrontation with Discord is interesting. Despite all his efforts to hide the Elements and scatter the ponies, he doesn’t care about they’re about to be used against him until the very last moment. More chaos at work, I think. It’s not that he doesn’t think it’ll work, but that he wants to give it the chance to muck up his own plans. For the same reason he gave the riddle when he first stole the Elements, he can’t be properly chaotic if he completely prevents his own defeat. That wouldn’t be any fun at all. I love the tropes in this series. It’s very… I grew up on Looney Tunes. Seeing some of those same themes repeated in modern television, introducing young viewers to familiar storytelling techniques, is very heartwarming. A little worrisome, in the sense that this is how cultural biases get passed from generation to generation, but generally heartwarming. 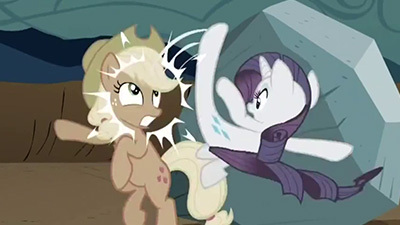 In conclusion: I’m a little surprised that Rarity didn’t just levitate her rock after she got her horn back. This episode marks the first of only really two times (in my opinion, anyways) during the course of the series that the instant friendship nuking of the villain in the climax is actually earned (and we have to wait a good while for the second one). Is it sudden here? Yeah, sure, but the story kind of set up that it was already understood that it would be if the elements were properly set up against Discord, hence his efforts to hide them until he could make sure that the Six weren’t in a proper state to use them. What really makes it work is the road blocks Discord put in the way to keep them from getting the pieces into place for so long. At the end of last episode, he’d already won, and the first half of this one is just him setting his win even more firmly into place. Twilight is the only one of the Six that he hasn’t either directly or indirectly “discorded”… and he doesn’t have to, as her already affected friends do it for him, wearing her down over the course of their attempt to get back to the library. Discord’s magic starts to warp them even further, pushing their inverted selves (or if you like my headcanon, buried negative traits) even further to the forefront. The changes the second go around are a bit more subtle, but actually fairly unsettling if you think about it. Applejack’s lies still aren’t particularly good, but she’s not uncomfortable with telling them anymore. Fluttershy digs up name-calling from her own past, emulating the bullies she’s encountered before. Something within Pinkie still can’t help but instinctively have fun with her situation, even as she firmly denies liking any of it, giving a really bizarre dissonance between her actions and her attitude. And Rarity goes from being fiercely protective of her new possession to starting to covet anything anypony else shows interest in. I don’t think the point was supposed to be that Twilight immediately knew that the Elements would be in her book, so much as she had a hunch that the book was the answer to Discord’s riddle. From the way she talks about it prior to opening it, she was expecting the book to have the location where the Elements were hidden rather than it flat out being the location itself, but of course Discord doesn’t have to follow the laws of physics and spatial properties and just hid the things in the book itself. I think Weston hits the nail on the head about Discord’s approach to the Elements in his plan. A game where you have absolutely no chance to lose isn’t particularly fun (nor is it particularly chaotic), so Discord has to include the opportunity for his own defeat into the mix. Granted, he does stack the deck a bit by feeding hard into Twilight’s initial assumption that he’s hidden the Elements in the labyrinth, and by the time he lets on that Twilight was looking in the wrong place the whole time it’s a bit too late. His prodding Twilight to continue searching might be him spinning the roulette again to up his own risks, but at least it part it’s there to rub it in that he’s won, as I think he genuinely does believe that the artifacts are useless now that he’s managed to corrupt at least five of the Six. Although based on his reaction to something almost happening when they initially find the Elements, he doesn’t seem to be that sure about it. It does make me wonder what would have happened had all six been there. Would it still have been a total dud, or would something have managed to occur? Would anything that fired off have been at all effective? Of course, it doesn’t work, and Twilight finally reaches the end of her rope, as the rest go their separate ways. Discord taunts her a bit (although there’s a tiny bit of something genuine there as he seems to really want to have someone to enjoy what he’s creating along with him), and when it’s clear that she’s been completely broken, he celebrates his ultimate victory. Which, in the end, is what sort of does him in. He assumes that nothing is going to bring Twilight back from the point of having given up (which, to be fair, he doesn’t have much reason to think otherwise), and probably most crucially, has sort of forgotten about the potential for Celestia to intervene. Which she does (poor Spike), with the letters she sends back to Twilight toppling the first domino in the chain to break Discord’s spell on all of them. There’s a bit of an echo of Twilight’s initial problem with confronting Nightmare Moon at play : she was so focused on trying to defeat the bad guy that she forgot about what she’d need to accomplish it – the help of her friends and the strength of everything that they bring to the table together. Once she realizes that, of course, things fall into place, and she’s able to pass on what she’s recalled to her friends to bring them back. I sort of wish that we were able to get more substantial scenes for all five instead of Dashie and AJ getting the lion’s share and the others sort of getting a montage, but that’s a minor gripe (and an understandable decision given the running time, as there likely wasn’t time to devote much to all of them and it does make sort of bookend the opener in a way since Applejack and Rainbow were the first and last to get turned last episode). Finally, if that ending scene looks familiar to you at all, well… it’s kind of supposed to. Really enjoyed this one. Like Gerf, I was a little thrown by the first half with the constant arguments of the characters, and thought they were a little simplistically defined, but I really like Tessa’s examination here and I’m glad none of it fell into any of the prolonged nastiness we’d have gotten had AKR been penning his one. And I was fully pulled in when Twilight finally cracked and went all boss, with hysterically sharp lines and gags involving Tom, and tried to force thing into working only for it to all go sideways in a heartbreaking moment, which could have come off as too much, but with all the surrealism on display, tears falling in the shape of a broken heart was the perfect touch. Then the reminder of everything she’d learned over the last season, the burn through her friends as the team falls back into place (agree with Tessa that I wish we got to see them all face the memories, but I dug the pace) and ultimately triumphing in the end. We again don’t have any lingering threat that’ll last the season, but I like how this played out, as an extreme circumstance forcing our heroes to face how far they’ve come as both people and friends. Not to mention some expertly boarded and directed slapstick surrealism that repeatedly had me rolling with laughter.